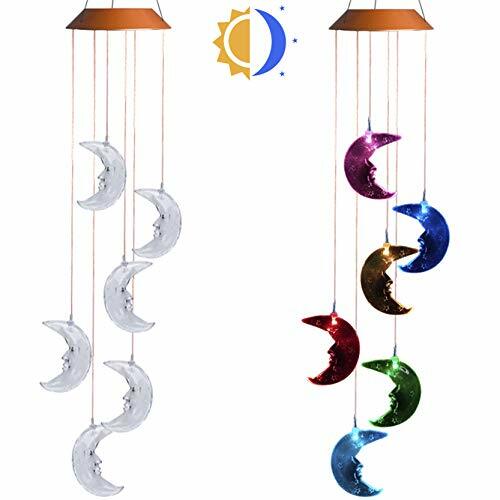 * Beautifully designed it features hanging moons shapes at night the 7 colors changing LED light. There is an integral solar panel on the top of the wind chimes so you can place the mobile anywhere in your garden that receives direct sunlight. ★ Leave the switch on "ON" status and exposed it to direct sunlight to charge the wind chimes for 6 to 8 hours. The duration of light depends on the level of solar products such as sunlight exposure, geographical location, weather conditions, daytime length etc. ★ Confirm the switch is on the "ON" position correctly, cover by solving the solar panel by hand, and check whether the light turns on automatically. ★ Please select outdoor place away from other light sources at night. It may not light automatically at night. The light sensor is very sensitive, and it will out of work under strong light. ★ If the solar powered wind chime does not turn on, please remove the rechargeable battery and replace it. 6. Approx: 26.5inches tall X 6inches wide. Garden lighting, garden art and "musical" all in one! Automatically turn on at dusk and off at dawn. Attractive 6 moons shapes are made of crystal clear ABS resin, which receives the sunlight, shines with the color of the rainbow, and wind blowing through the day. If you have any questions about this product by Asbana, contact us by completing and submitting the form below. If you are looking for a specif part number, please include it with your message. Sitting Bird Wind Chime - Solar LED, Porcelain & Steel - White.